It was coold again today. Freezing cold. zero degrees C. And the forecast said it would not warm up today. 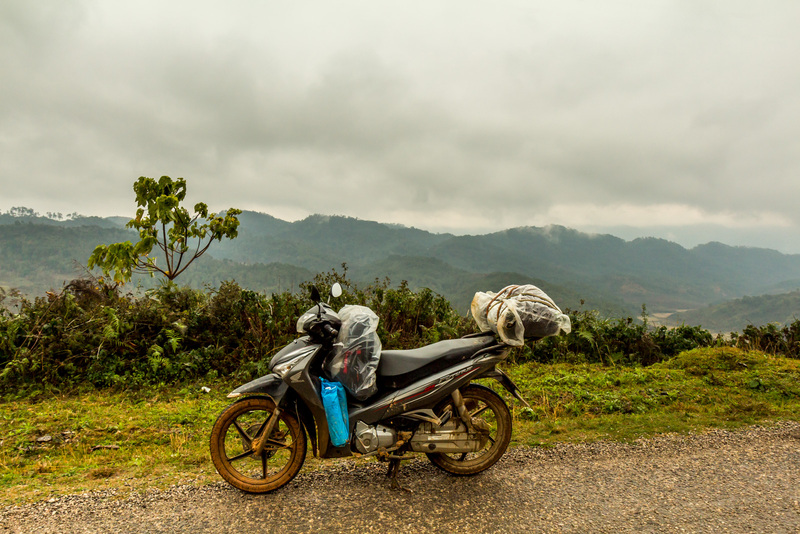 There’s nothing in Sam Neua, so I packed up and hit the road. At least starting the bike was easy this morning. I found some Vietnamese ladies selling low-quality Chinese hats and gloves. I bought a second pair of gloves and a second hat that covers my whole head with an opening for my face. Now I have two pairs of chintzy gloves, and two chintzy hats. I felt a little warmer. I had a long ride of 150 km. The road was narrow, winding, and went up and up. It was really cold once I was moving at a slow 40 kph. In fact, as I went up and up, my hands started to hurt. I had to stop every 10 km and put my hands in my pockets until they stopped hurting. At this pace I would never get to Muang Hiam. 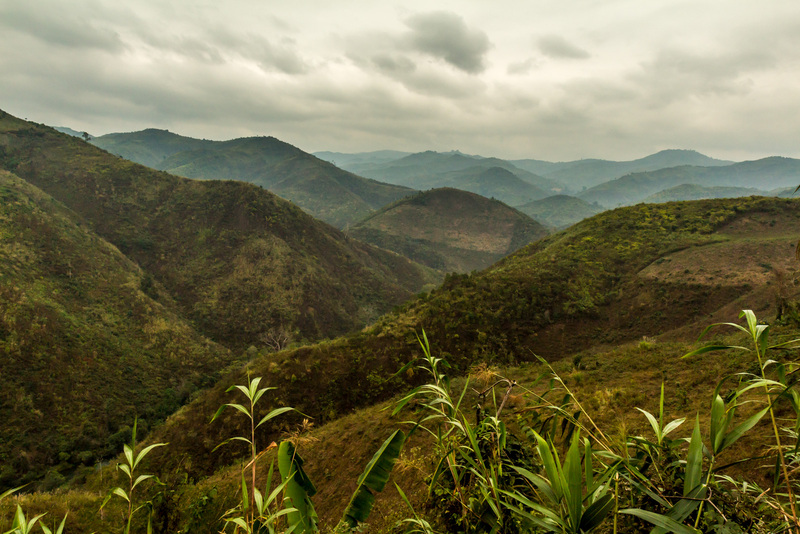 There were km markers counting down to Phou Lao. I figured it must be a major town with guesthouses, so I would stop there. There were lots of amazing mountain views. I went through remote stretches with nothing, just green hills. 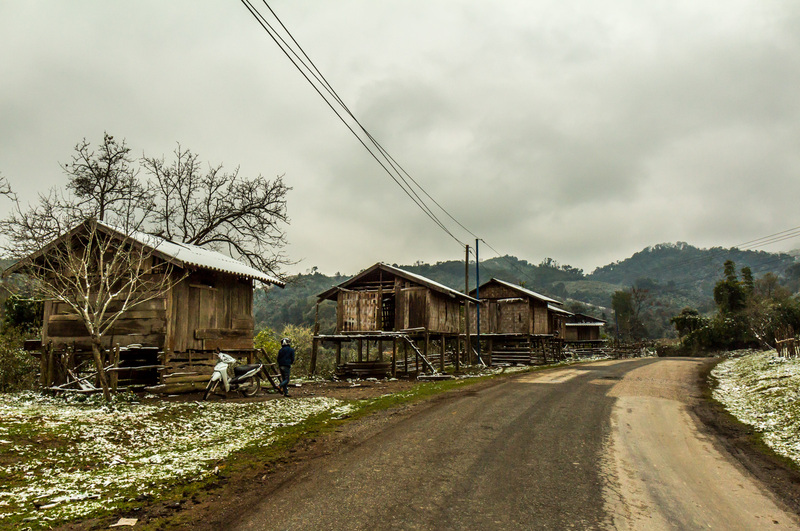 I passed through tiny villages of wooden stilt houses with thatched roofs. There were no real towns. There were no restaurants or guesthouses. There was very little traffic. 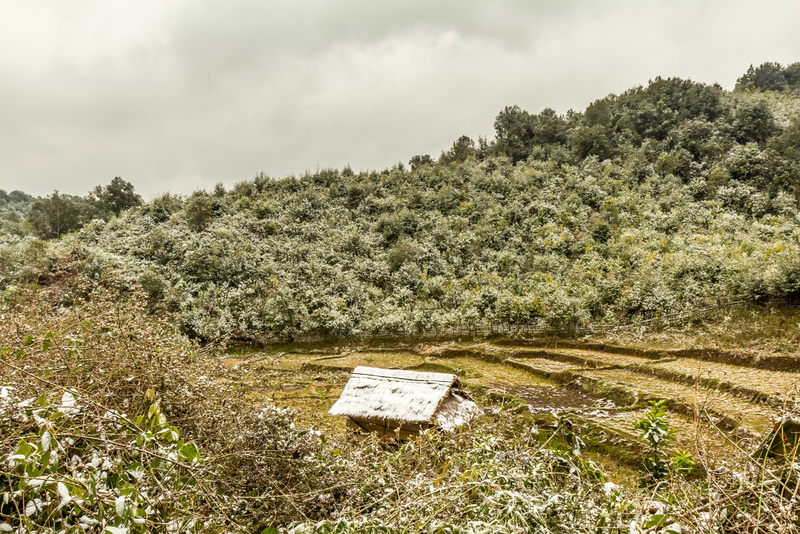 Snow on the rice terraces. It got colder. And then I saw frost on the trees. Then there was a dusting of snow. Lao people were stopping their SUV’s to take selfies in front of the snow. The little wooden houses had their roofs covered with snow. 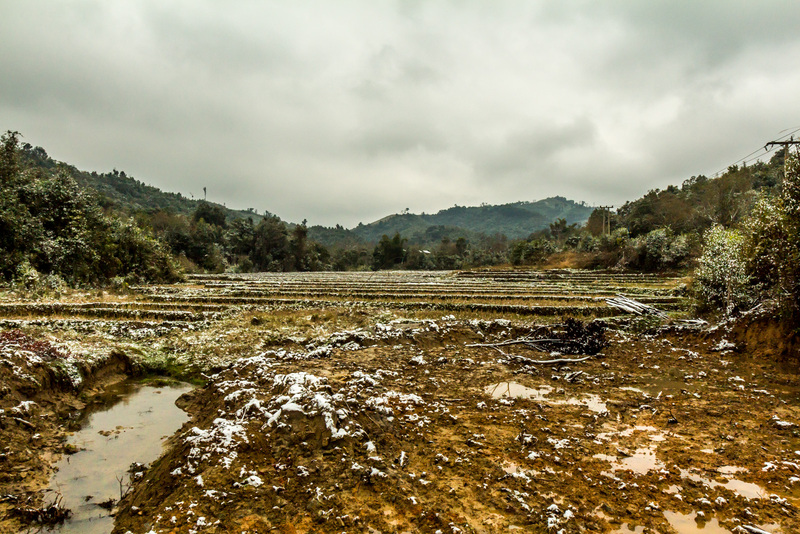 There was snow on the terraced fields. Later I discovered there is a major cold front from China, and the whole region is frigid. Then the freezing rain started. Could this get any worse? I started going down. As I went down, it got less cold. My hands stopped hurting. It wasn’t warm, but it wasn’t painfully cold. But then I would go up and it got cold again. Then back down. This repeated. Thankfully the freezing rain stopped. I finally got to Phou Lao. But it wasn’t really a town. It was just a big village of wooden houses. There were no guesthouses or restaurants. So I would be going 60 more km to Muang Hiam. There were stretches of road that became mud. Thick, deep, gooey mud that was hard to drive on without slipping. I had to use my feet, and my shoes got covered in mud. I’m glad I didn’t get a shoe shine in Hanoi! Everybody was huddled around fires. I was almost feeling warm. 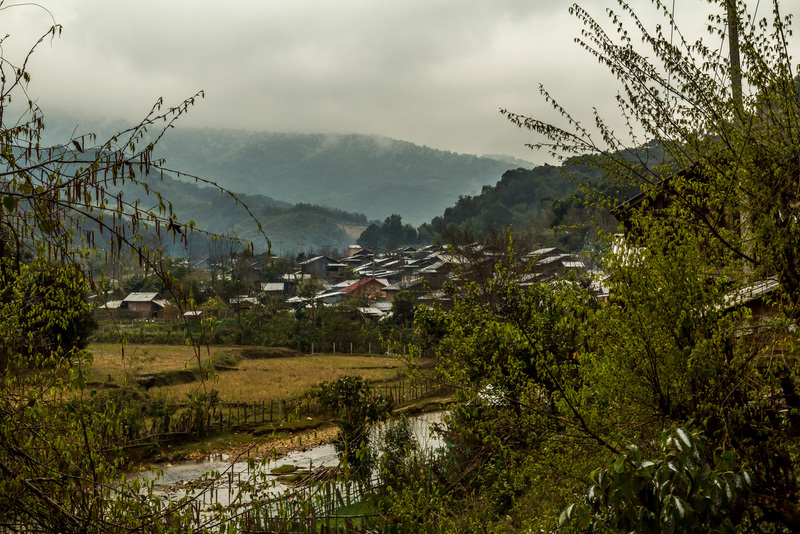 I continued to pass through tiny villages. None of them had restaurants. I would not be eating lunch today. I went through another small village, then entered a long remote stretch. The road started going up. I had been hoping I was finished going up. I turned a corner, and there was a view of the road going way up the mountain. So up I went, and up. Alone. There was not traffic. It got colder. Then frigid. My face started huring. My hands started to hurt again. I kept going way up. I did not see a soul. It was too cold to enjoy the views. Some frost appeared. 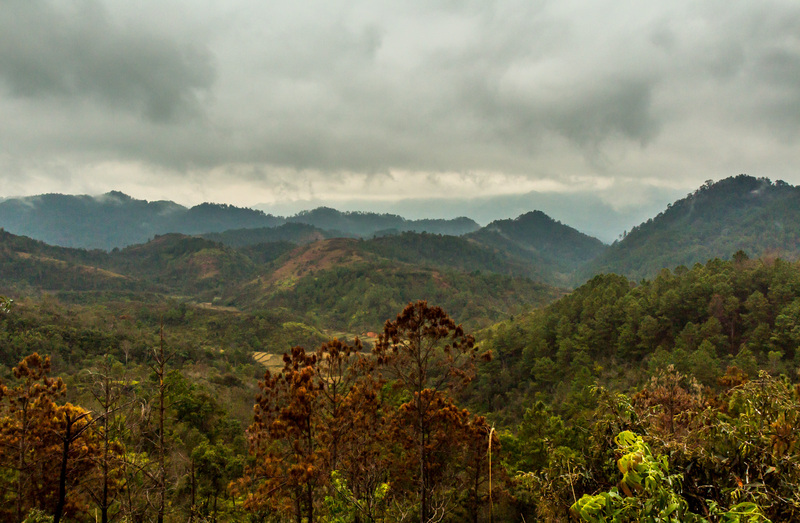 I was in a lush forest, with green trees towering high above me on both sides. I turned a corner, and all the trees were white. It was surreal. The road kept going up. I saw some ice by the side of the road. It got foggy. I could see the top of the mountain, where everything was white. I was going up there. I turned another corner. I saw ice on the road right in front of me. I like to think that if I would have seen the ice far ahead of me, I would have known that my bike wouldn’t handle on it, and I would have stopped and pushed it. But the views were nice. But I didn’t have any time to think. I was still in the middle of turning right. As soon as my front wheel touched the ice I wiped out. I wasn’t going fast, but I fell over on the right side. I was in the middle of the road with my right foot pinned under the bike. I wasn’t hurt. It was hard to get the bike off me and pick her up because the road was all slippery ice. I eventually got her to the side of the road. Her right footrest was bent. And the right mirror was loose again. Minor damage. This was the summit. I went really slow down to Muang Hiam, less than 20 km away. There was no more ice. I made it to Muang Hiam with no more incidents. It is tiny. But I like that better than the spread out Sam Neua. It was easy to find the guesthouses, restaurants, and markets. It’s cold here, and all the restaurants are open to the air. The hotels are not heated. I went to a restaurant that didn’t have chicken, fish, or sticky rice. Like all the restaurants I’ve eaten at so far in Laos it was surprisingly expensive. Maybe that’s because unlike Vietnam, people don’t typically eat in restaurants. There aren’t that many of them. It’s supposed to be frigid for one more day. I have a 170 km ride ahead of me. I don’t want to do that in the cold. I’ll stick around here for a day. 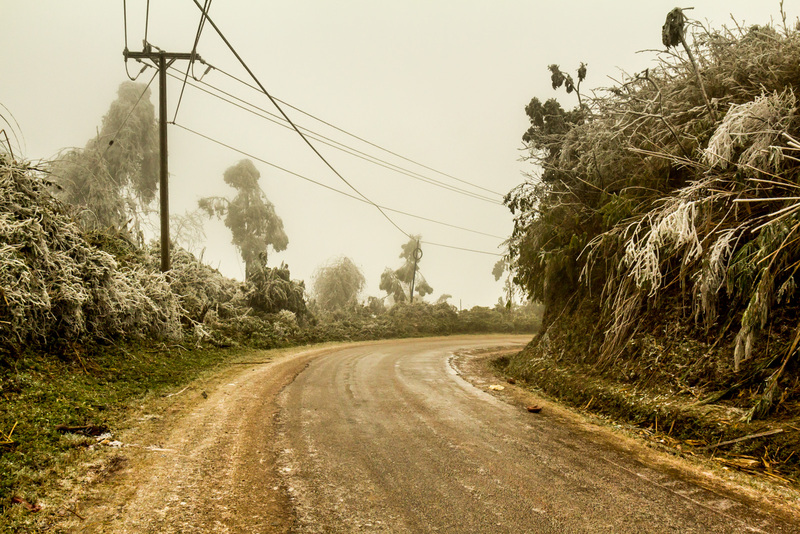 « Vietnam To Laos Day 5: Coooooold! 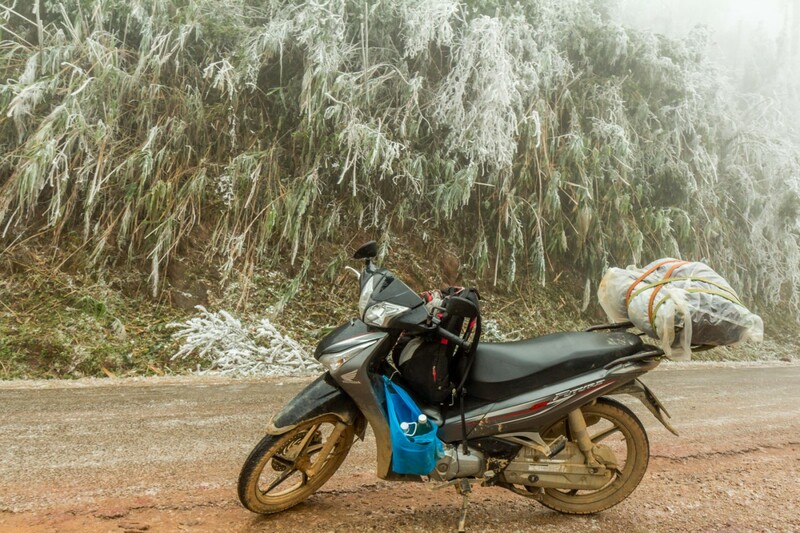 ← Vietnam To Laos Day 5: Coooooold!